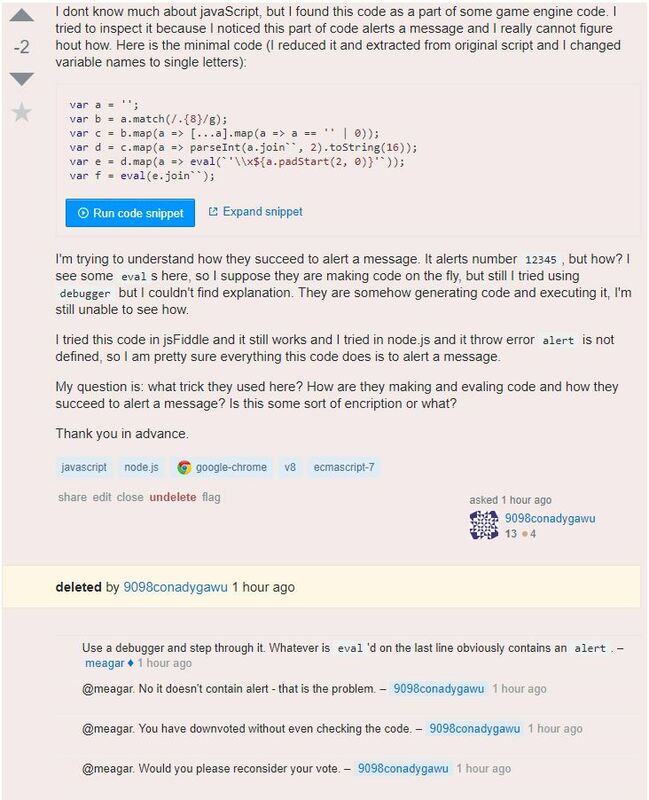 I asked my first question ever on Stack Overflow and it got 2 downvotes in the first two miliseconds, so I deleted the question to not receive more downvotes. I was preparing for that question about a week, I have read help center page and "how-to-ask" page and I also took a tour through this community and I read everything about what is allowed and what is not allowed on this website. I spent three hours writing my question and preparing it very well, but still I cannot see what is wrong with my question. So, I am therefore aksing here why is my question received a lot of bad score in such short period of time? I strongly believe that my question is indeed on-topic, well-defined, clear and about programming. In comments a moderator said that I should use a debugger. But, I have already in my question mentioned that I indeed used debugger, but it didn't help very much. While debugging the script, I noticed much nonsense stuff and then... alert(12345) appeared out of nowhere. It actually took more than 12 thousand debugger steps to reach the very end of the script and really I still cannot see why that script works like it does. I am not asking downvoters to retract their votes, but I am asking the rest of the community to explain why is that question downvoted. Is it off-topic? If yes, what exactly from the help-center page forbids such question? Is it unclear? If yes, which part exactly is unclear? Is it something else? If yes, what and why? Here is the link to the question I am talking about (10K+ only, it is deleted). To avoid extended discussion in comments, here is a summary of my response. There are a lot of questions asking about "why this code works like that", etc. It is really not always easy to debug a code. Look at the one question I posted a link in this meta post. It has 2 upvotes, but I dont see why is that question better than mine. Or the one question linked from it, it has more than 20 upvotes, but it is asking the same thing "debug this code for me". Debugging is really not a trivial task, today websites use a lot of advanced obfuscating techniques, making it very hard for developers to understand their strategy and how code works. Take a look at THIS question. It has 67 UPVOTES, BUT IT didn't even talk about any attempt made from the OP. Why? Why that question has so many upvotes, while my question, full of attempts and explanations has -1. If it is not an injustice, then I don't know what is. 'first two miliseconds' don't know about that, but I was fairly sure you question was going to be bad after ~500ms. I'm now 99.9% sure that your question will be getting a downvote and/or close-vote. It's not your code, and there may be a copyright issue. Assuming there is not, it's likely to be some over-optimized crap that needs a lot of work to take apart and understand, and you would prefer someone else did it. This is gonna be 'Too broad' if not 'Unclear'. Sure enough, it's a load of obfuscated crap that someone shoveled onto the net. OP wants someone else to work out how it works. It's going be of next-to-no use to future SO users/visitors. OP has shown no evidence of investigation/debug. 'so I am assuming each downvote should correspond to at least one comment' nah, the skilled and experienced developers who answer good questions on SO have little time to waste on explaining why bad questions are bad. Down and close vote for sure. Debugging is really not a trivial task, today websites use a lot of advanced obfuscating techniques, making it very hard for developers to understand their strategy and how code works. "De-obfuscate code for me" is not useful for future visitors and hence deserves downvotes and close votes. Please note that there is no way to know what you did to investigate the problem without actual information in the post. Now at that point you are expected to start ... complaining that duplicates are not friendly - but that is another duplicate :). Possible to display a hint when the user is asking about segfaults without showing debugging effort? Why was my question upvoted and became notable, when it was heavily downvoted at the beginning? Why is this question of mine being downvoted? Why did my question asking for help debugging jQuery event handlers get downvoted and close-voted? What should be done with this specific highly upvoted question asking how to debug a Node.js application? Why was my neural networks question downvoted?